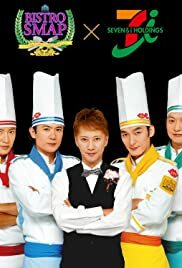 Although I would argue that Katori Shingo is a vaguely better singer than Kimura Takuya, I do have to agree that Suma-suma is quality viewing whether you can stand Smap's awful music or not. Some of the regular characters in the skit scenes are hilarious, (Damena ningen!) whereas the Bistro Smap section leaves you absolutely watering at the mouth. The only down-point is their insistence on singing at the end off the show every week, but even that can be good for a laugh - the contortions on Nakai's face are particularly amusing.